"...thanks a lot for your help your product is excellent"
"...This script and HTML protection software represents a very effective toolkit for the protection of php scripts and HTML generated by them. Simple installation and offers very good value for money"
"Your products so great and I'm glad I found it"
"your ...Codelock v.2.7 LOOKS GREAT and is really WONDERFUL... THANKS..."
"Its a very clever script!" "The HTML Protector for Joomla Websites"
Now you can protect all your HTML source code for your Joomla pages. It encodes ANY page you specify including modules, components and everything else! This module is easy to install and easy to configure. Plus it's Search Engine friendly! 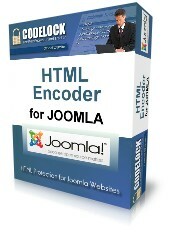 Protect the HTML source code for any of your Joomla Websites! You can select Auto Detect mode! If the visitor to your site is a human, it will encode the source code. If the visitor is from a search engine bot, it will show the full source code. It's Search Engine friendly! This feature is not found on normal HTML encoders! Yes, its simple, but its very effective and works on your Joomla pages as well as all your plugins, modules and components!